Wouldn’t it be great to explore the night sky on a bat car, hang upside down with bats and battle evil villains along with Bat Hero. Boys and girls, be prepared to go through intensive training where you will be able to demonstrate your abilities to be strong and brave just like Bat Hero! 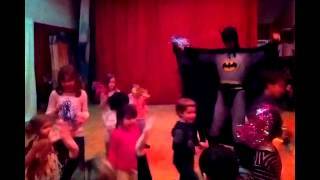 After going through superhero training, kids will be ready to face the Joker who comes to ruin the party. Using their newly learned and enhanced skills kids will help Bat Hero defeat the villain and continue the celebration.